Could Going to College in Canada Help You Save Money? Lauren Duvall wanted to go to college in a large metropolitan city somewhere outside the U.S. But instead of heading to Paris or Barcelona, she chose Montreal. “Canada flies so under the radar,” said Duvall. The Florida native was drawn to Montreal’s predominantly francophone community; it seemed like the perfect place to hone her high school French skills. Duvall attended McGill University, sometimes referred to as “the Harvard of Canada.” Tuition cost her about US$15,000 per year — a fraction of the cost of the Ivy League schools she was also considering — though she said her biggest moving expense was the cost of upgrading her wardrobe to fit Montreal’s freezing winters. Her freshman-year dorm room cost around $900 per month. After her first year, she moved into an apartment that cost $600 per month. “The financial benefits were just an added bonus,” Duvall said as she described the “world-class education” that gave her a bachelor’s degree in international development with a double minor in political science and French translation. And she’s not the only one discovering those benefits. Should Americans Consider Going to College in Canada? In December 2016, The Toronto Star reported a 70% increase of American applicants at the University of Toronto since the previous year. Other Canadian colleges also reported increases of 20% or more. It seems that American high school seniors are interested in heading north of the border. But is going to college in Canada a smart financial decision? Here’s what it would really cost to attend university in Canada — and how those costs compare to those here in the U.S.
Before you can attend college in Canada, you’ll need to take care of some paperwork — and that comes with its own costs. Note: At the time of publication, one U.S. dollar equals CA$1.33, meaning American dollars go about a third further up north. If you don’t already have a U.S. passport, you’ll need one. A new passport costs $135, and a renewal costs $110. Also known as a student visa, a study permit will run you CA$150 (US$111). This evidence can include your recent bank statements, student loan approval, your parents’ bank account if they’re paying for your college, proof you’ve already paid tuition, etc. As an international student in Canada, your university will require you to have health insurance. Your options vary depending on where you’ll attend school. Some provinces, like British Columbia and Manitoba, offer health insurance to international students. You’ll generally want to apply as soon as you arrive, and costs vary based on province and your age. However, these plans may not cover long-term prescription medication (like birth control), prescription glasses or dental care, so you may still want to consider adding private insurance. If the province where you’ll attend college doesn’t offer coverage to international students, you’ll need to purchase a private health insurance, typically through your school. At the universities I mention below, private health care for international students can cost anywhere from CA$292 (US$217) to CA$993 (US$741) per year. First, let’s consider what it costs to go to college right here in the United States. At an in-state public college, you’d pay an average of $24,610 for the 2016-2017 academic year, according to College Data. The in-state cost of attendance for an undergrad at the University of South Florida (USF), the college I attend, is $23,494 per year. For comparison, attending Harvard for the 2016-2017 school year would cost you $66,900. If you’re not covered on your family’s health insurance plan, add another $2,630 — that’s more than triple the cost of the most expensive private health insurance I found at Canadian universities. With those numbers in mind, let’s see how a few Canadian universities stack up to the cost of college in the US. Tuition: Depending on your field of study, tuition ranges from CA$15,942 to CA$40,802 (US$11,896 to US$30,678). Books and fees: Fees range from CA$1,668 to $2,968 (US$1,254 to US$2,231). Books and supplies cost about CA$1,000 (US$751) per year. Health insurance: This is mandatory, and it costs CA$993 (US$746). Meal plan: The mandatory meal plan costs CA$5,475 (US$4,116) if you live on campus. On-campus housing: Residence costs range from CA$6,633 to CA$12,947 (US$4,987 to US$9,734). For more comprehensive pricing depending on your degree path, use the undergraduate fee calculator on McGill’s financial aid website. Ranked #32 on the QS world university list, the University of Toronto has three campuses in different areas of the city and its suburbs. I priced residence and meal plan costs at the Scarborough campus. Tuition: The cheapest degree option, a bachelor’s in forestry, costs CA$28,790 (US$21,646), while a bachelor’s of applied science and engineering would set you back CA$47,020 (US$35,353). Books and fees: You’ll pay an estimated CA$1,695 (US$1,274) in fees, and about CA$1,500 (US$1,127) for books. Health insurance: You’ll need to buy health coverage through the University Health Insurance Program, which costs CA$612 (US$460) per year. Meal plan: U of T’s meal plans are optional, and range from CA$2,820-$3,720 (US$2,120-$2,796). On-campus residence: Housing fees range from CA$5,540 to $9,343 (US$4,165-$7,024). Located in Winnipeg, the University of Manitoba is known for offering more than 100 degree options, and for producing more Rhodes Scholars than any other Western Canadian university. Tuition: Depending on your degree path, tuition costs could range from CA$13,400 to CA$24,400 (US$10,075 to US$18,345). If you happen to be from Minnesota, you’ll get to pay domestic tuition, so it’ll only cost you CA$4,100 to CA$10,500 (US$3,082 to US$7,894) a year. Books and fees: Depending on your program, they’ll run you between CA$700 and CA$4,800 (US$526-$3,609) per year. On-campus room and board: You’ll have many options to choose from, depending how many meals you want to eat in your residence. Prices range from CA$6,132 to CA$12,361 (US$4,610 to US$9,293). What If You Want to Live Off Campus? If the dorm life isn’t for you, you might want to consider living off campus, with or without roommates. You’ll also have to factor in transportation costs to your school. You’d want to budget somewhere between CA$10,000 and CA$15,000 (US$7,518 to US$11,278) to cover accommodation and food costs, according to TopUniversities.com. McGill estimates rent to cost between CA$500 and CA$1,300 per month (US$375 to US$977) in Montreal. As of February 2017, Numbeo reports the average rent for a one-bedroom apartment in a Canadian city is around US$850, whereas in the U.S. it’s about $1,200. Outside of the city, Canadian rent is a little under US$700 compared to $900 in the States. Of course, these prices all depend on which cities and towns you compare. Feel free to do your own comparison between where you live and a destination in Canada — it’s interesting to see how the numbers differ, and it’s an important factor in your decision. If you’re worried about earning money during college, fret no more — your study permit allows you to work without applying for any other visa. You just have to attend college full time, have a valid study permit, and apply for a Social Insurance Number (SIN) — Canada’s version of your SSN. Once you have your SIN, you’re permitted to work both on and off campus. You can only work up to 20 hours per week off campus during normal school hours, but during school breaks, you can go full time. You can also work as a co-op student or intern without any additional paperwork. After studying in Canada, you might be interested in continuing to work there after college. Thanks to Canada’s post-grad work permit program, international students can stay in the country and work for up to three years. As long as you studied for at least eight months, you’re eligible to apply for this permit. Even though attending college in Canada can be cheaper than paying in-state tuition at some American schools, you might still need financial aid. First, check the school’s website to see if it offers special scholarships for international students. For example, the University of Winnipeg provides various scholarships for international students. You can also apply to options on this list of 100 scholarships to help you pay for college. But first, confirm you could use the award at a Canadian school so you don’t waste time applying to scholarships that won’t help you. Most of the Canadian schools I looked into accept U.S. federal student loans, but you’ll want to confirm which types you can use at your chosen schools. 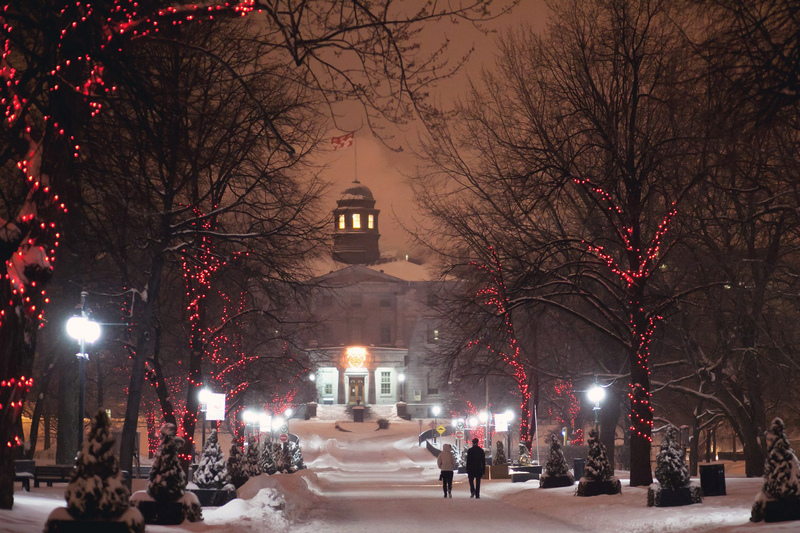 McGill University accepts both Direct Loans and Parent PLUS Loans. The University of Toronto accepts Direct Loans and PLUS Direct Loans. To apply for student loans, just fill out the FAFSA like you would if you were planning to attend college in the U.S. If you’re not sure what type of loan works best for you, refer to our ultimate student loan guide. Is It Cheaper to Go to College in Canada? As much as I wish I could give you a definitive answer on this, I can’t. It depends on so many factors — where you live now, what degree path you choose, which university you’d want to attend and what U.S. universities you’re already considering. U.S. News reports Canadian universities give students “a good bang for their buck” — but you’ll have to do the math to see whether it could be a good option for you. Your Turn: Have you ever thought of going to college in Canada? Do you know anyone who has? Jacquelyn Pica is an editorial intern at The Penny Hoarder. She enjoys the warm sunny ocean view from her university in St. Petersburg, Florida.